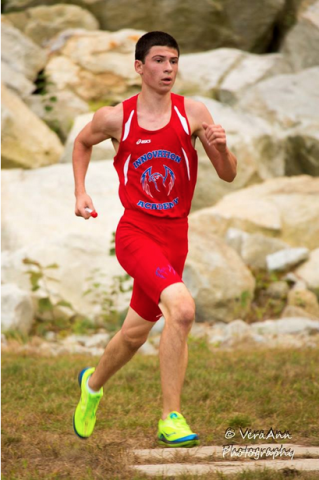 This season is looking to be the best one yet for IACS’ cross country teams. Especially on the boys team, despite a few crushing blows from injuries, the team is one of the favorites to take the top spot at the division 6 State Championships. The beginning of the season started off with some tough news. Injuries impacted three out of the top five runners on the boys team, including a particularly tough setback of losing their number two boy to a stress fracture, which will have him out for two months. However, the boys’ team goal is still to finish second or better at the Eastern MA Division 6 State Championship meet, qualifying for a second year in a row for the Massachusetts MIAA All-state meet. Head coach, Federico Pereyra said that despite the losses, they can still come back and meet their goal. “While our goal remains the same (to finish in the top two) for the Eastern MA Div. 6 meet, the boys will have to be extra diligent in order to make up for being short-handed. We will make the best use of the next six weeks putting in some quality training to hopefully achieve our goal.” said Pereyra. As well as the team competition, the boys team also has some strong contenders for the individual top spot at the D6 state meet with Junior, Nicholas Passarelli leading the pack. At the 2014 D6 state meet, Passarelli finished 3rd, behind two seniors. Since these seniors have since graduated, he is the top returner and one of the favorites to win the race. Senior, Cedric Nsilo-Swai also has a strong chance at a top finish, with times not too far off from Passarelli’s. This year on the girls side is looking more exciting than ever before. Although the team is a young one, having added four freshman to the team in addition to only two returning athletes, all of these freshmen have two or more years of experience on the middle school level. Which will hopefully be an asset to the team going into the state meet. At the 2014 Division 6 state meet, the girls team finished 22nd. This year the team is setting their sights higher, and hoping for a top 15 finish. Pereyra is optimistic for the girls’ chances based on the season so far “I think that a top 15 finish is possible for this year, given the talent and work ethic that the team has displayed so far.” said the Head Coach. The third meet, however, was the strongest, showing this season so far for both teams (the boys and girls). This recent home meet of the season was also the first relay meet that IACS has been a part of, in which teams of three each ran 2 mile legs. IACS’ number one boys team won the meet with; Passarelli, Nsilo-Swai, and Freshman Michael Crane. While their number two team took third with; Senior, Jack Panneton, Junior, Paul Accettullo, and Junior, Calvin Lee. The girls teams also did well at the meet, their number one team taking second place with; Freshman, Kathleen Rozen, Junior, Sarah Mayotte, and Freshman, Michaela Kelly. The team’s next meet is The Charter School Invitational on Monday, October 12, at The Advanced Math and Science Academy in Marlborough, MA. Stay tuned on theinnovator.org for information on upcoming meets and how the team is doing, and congratulations to the six captains of the cross country teams this year: Seniors, Cedric Nsilo-Swai and Jack Panneton; Juniors, Nicholas Passarelli, Jane Nealey, and Sarah Mayotte; along with Freshman, Kathleen Rozen!